In this special you get 100 CLEANED Spinner Gourds that are 1"-2" tall. These little gems are perfect for earrings, pendants and ornaments. Extremely limited supply but all are guaranteed to be at least 90% cleaned. I this special you get 50 CLEANED "Little Guys" that are 2"-4" tall. These are perfect ornament sized gourds that have a very thick shell that is ideal for carving or wood burning. The best part about them is that they will arrive to you completely cleaned!!! In this special you get 11 CLEANED Club Gourds that are 2'-3' long. These are ideal gourds for spirit dolls, unique shaped rain sticks and floral arrangements. In this special you get 40 CLEANED Hardshell Gourds that are 3"-4" wide. These gourds are the absolute perfect size for your Christmas tree, but the best thing about them is that they arrive to you already cleaned!!! In this special you will receive 50 spoon gourds that range from 4 inches to 7 inches long. Guaranteed to be at least 75% clean. In this special you get 9 CLEANED 6"-7" Apple Gourds. These gourds look identical to large apples and are a great first gourding project. In this special you get 9 CLEANED assorted sitting gourds that are 7"-8" in diameter. This is a great assortment for those wanting nice flat bottomed gourds for bowls or pots. The best part about them is that they arrive at your doorstep already cleaned. In this special you get 9 CLEANED Canteen Gourds that are 7"-9" in diameter. These are perfect for shallow bowls, purses, wall pockets and actual canteens. The best part is that they arrive to you already cleaned!!! In this special you get 14 CLEANED Dipper Gourds that are 3"-5" in diameter. These are great for water ladles, vase and all kinds of fun animals, but the best thing about them is that they arrive to you already cleaned. In this special you get 50 CLEANED Egg gourds that are 2"-4" tall. These are great gourds for Christmas ornaments and Easter Eggs and we have a great crop of them this year. Guaranteed to be at least 75% clean. In this special you get 7 Cleaned Kettle Gourds that are 8"-9" wide. They are nice and thick for carving and wood burning. Extremely limited supply!!! In this special you get 12 CLEANED Extra Long Handle Dipper Gourds that are 18"-28" long. The are great for unique floral arrangements and fantasy animals, but the best thing is that they arrive to you already cleaned. In this special you get 12 CLEANED large banana gourds that are 12"-17" long. These are perfect for making spirit dolls and rainsticks. They are also very thick which makes them great for carving and woodburning. In this special you get 9 CLEANED Bushel Gourds that are 7"-8" in diameter. These are the largest gourds we have ever offered cleaned in a special. We have a very limited supply of these. In this special you get 13 Cleaned Medium Bushel Gourds that are 6"-7" in diameter. They are perfect gourds for bowls and all of them have flat bottoms, but the best thing about these.....THEY ARE CLEANED! In this special you get 10 CLEANED cannonball gourds that are 5"-6" in diameter. They are perfect for small bowls and can be carved and wood burned. The best thing about them is that they are cleaned!!! In this special you get 12 CLEANED Penguin gourds that are 7"-12" long. These are some of the best gourds we have ever grown but the best part about them is that they arrive already cleaned!!! These are great for birds, rattles, powder horns and small vases. In this special you get 12 CLEANED People gourds that are 7"-12" long. 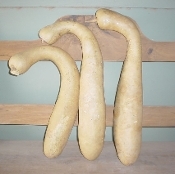 This is a new variety that happened this last year when the bottle and penguin gourds crossed creating an elongated bowling pin shape that is perfect for making spirit dolls. In this special you get 75 CLEANED Small Pear Gourds that are 2"-3" wide. These make very good small bowls and great Christmas ornaments. In this special you get 16 CLEANED sitting gourds that are 3"-4" in diameter. This is a great assortment for those wanting nice small flat bottomed gourds for bowls or pots. The best part about them is that they arrive at your doorstep already cleaned.